Please Note: Payment amounts are estimates only, please contact us for a more accurate quotation. J & J Caravan and Motorhome Sales are one of the North Wales leading suppliers of used touring caravans, offering one of the biggest selections of used caravans for sale in the area! J and J Caravans are a specialist Hobby and LMC used caravan dealer based in Clwyd. We are proud to offer you a first-class customer service and very competitive pricing, so please take time to browse our stock list and take a look at some of the superb caravans and motorhomes we have for sale at our site in Rhyl. If you are looking for great savings on quality used caravans for sale in the Rhyl area, then you have reached the right place. We stock a range of used caravans to suit all budgets and lifestyles, so we are sure to have the right caravan for you. So, if you are looking for a second-hand caravan in Rhyl, then don't delay, call us today. If you are working to a budget for your new caravan or motorhome, we can offer low cost monthly finance that will help you own the caravan or motorhome of your dreams, in fact in some cases you may be able to afford something bigger or better than you thought you could. 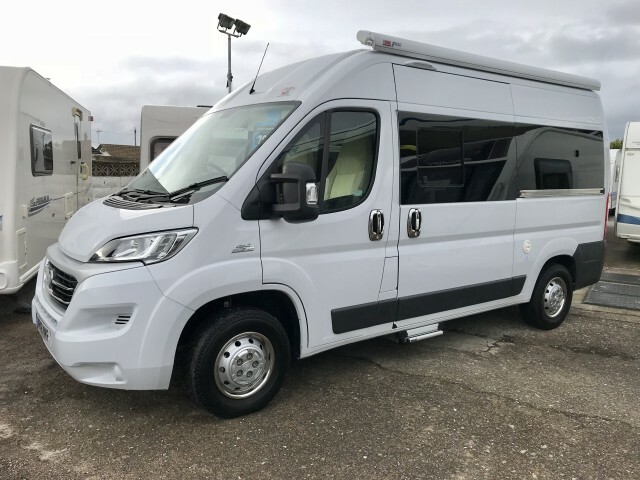 Browse or caravan and motorhome stock and you will see monthly prices and examples of the kind of finance deals available to you, all of which are subject to status and can be adjusted to your personal requirements, just ask for details. In order to offer caravans to suit everyone we make sure that we update our stocklist regularly. It is therefore always worth giving us a call, even if you don't see what you are looking for on our website. Looking for Used Caravans for Sale? We are confident you will not be disappointed with our selection of quality used caravans. At J and J Caravans we offer an extensive range of services and extras meaning that you can buy your used caravan with confidence and peace of mind. Our showroom in Rhyl stocks a wide range of caravans that are ready for viewing today. For your peace of mind, all pre-owned caravans leave us fully serviced, valeted & supplied with a battery and pump too. While our comprehensive three month 'Back to Base' warranty means that should you happen to experience an issue, simply come back and allow us to rectify it for you. Please check with us before travelling to see a particular van or motorhome, as there is often a delay between a sale and it being taken off of the internet. If you can't see the type of caravan you're looking for, please let us know as with new stock arriving regularly, we may already have the ideal one for you. We are open 7 days a week and can arrange out of hours viewings if preferred. If you see a vehicle you like in our online showroom, please call us first and we will be happy to accommodate your needs and arrange a suitable viewing time. Directions, opening hours, telephone numbers and enquiry forms are available on our Contact Us and Location pages. Here at J & J Caravan Sales we pride ourselves on giving you the best advice possible with a friendly service when buying one of our quality used caravans and motorhomes in North Wales.